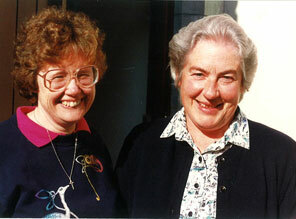 Kath Burke rsm recalls: From the time Mary Trainer rsm visited Australia for our second National Chapter in December/January 1987/88, I felt an absolute confidence and huge joy that our widely-flung Mercy world would one day be more closely linked and it would be Baggot Street (and perhaps only Baggot Street) that would bring us all together. In Mary we were gifted with a person of grace and charisma, vision and administrative skills: she became in a sense our international Foundress. For me the work of the International Committee was a privileged experience, Not without pain, misunderstandings and difficulties, we kept working to find a solution acceptable to each of our national groups. Mary Quinn rsm remembers:Well do I remember the phone call I received asking me to come to Dublin for an interview.! What joy! What trepidation! While I was ecstatic when asked to take up the position (of Project Manager) in 1990, I was aware that the way ahead was by no means mapped and only minimally clear. Whatever the official title of the role, I was to be the contact point for committees of Mercy Sisters across the world who were working on proposals, professionals who were engaged along the way and the Steering Committee. In relation to the whole project, I have always valued the amazing fact that so many were involved in the development of the final proposal and, in particular, that thousands of Sisters of Mercy across the world collaborated on this project through a committee system. What a feat! But then we were walking in Catherine’s footsteps and depending on God’s Providence. The work I engaged in put me in contact with many truly amazing Mercy women. ... I could not have found myself in better company Their gifts to me went far beyond the work site and have enriched my life ever after. I believe that one of the gifts of Baggot Street has always been the giving of more. Catherine’s grace went far beyond the original house and Mercy International Centre surely has surpassed our dreams of the eighties. I had the privilege of making contact with those professionals who would be needed in the event of the dream materializing: These included interested architects to be shown over the building, specialists in architectural heritage and other heritage materials, to provide information on what should be saved and man others. For me, this was a wonderful experience of widening horizons and education in cultural differences. Mary Quinn rsm was Project Manager of the MIC Development. Elizabeth McCaver rsm tells: When I arrived on the scene to fill the role of Finance manager and facilities planner, the Mercy International Congregations and Institutes had been working together for some time. The feasibility study had been done, and the plans were in place but the finance wasnot! Serious difficulties were being experienced by one or two groups regarding the raising and provision of finance for the project . Indeed shortly after my arrival from New Zealand, I was informed that the project was on hold – perhaps not going to proceed and the word ‘off’ was even used. Some time lapsed and then I was to experience Mary Trainer’s negotiating skills. She had asked for a ‘conversation’ with the leadership groups involved. At this gathering some financial difficulties were ironed out and the project was on course again. It is important to note that the work of restoration and preservation was done on the narrowest of budgets throughout and finance was a constant concern. Before the builders could move into the main building we had to distribute the contents of the building after160 years of occupation as a convent. There were articles to be preserved and furniture and materials stored for re-use, as well as things to be disposed of. The newly arrived Sisters from Auckland gave great help in packing and delivering valuable documents, paintings, artefacts and various chapel articles to Booterstown for safe keeping. The builders then started taking over the building. They prepared the wing over Convent Close for Mary and me to live in and work from. It was comfortable enough but the winter we spent in it was very cold and we only had an electric heater! Mary suffered from what the Irish call ‘chilblains’ and Mary called ‘frostbite’! Once the builders actually started on the house there was demolition and plenty of noise. To this day when I approach the front door of MIC I have visions of a jeep driving in and out through the doorway. The door itself had been removed of course but the machine gave me shivers of concern every time I saw it. However, the builders were most helpful and respectful especially regarding our concern for the cemetery aound which yhey had to manipulate their machinery. Elizabeth McCaver rsm was on the Transition Staff as Steward over the refurbishment and Finances. Canice Hanrahan rsm reflects: The now famous ‘conversation’ between Sr. Mary Trainer from Philadelphia and Sr. Sebastian Cashen, leader of the Dublin Mercy congregation, was the catalyst for a change different to any experienced hitherto. It was a kind of annunciation, the incarnation of which is still ongoing. It generated excitement and indifference, enthusiasm and reluctance, anticipation and fear. It initiated a consultation process cross the Mercy orld that was a logistical challenge of enormous proportions. I’m happy to have been a small part of it. The ideas and suggestions were many and varied, The vision for ministry would ultimately shape and influence the renovation/restoration of our heritage building. The suggestions came in three pre-determined categories: heritage, renewal and ministry. As I reflect on it now, our understanding of ‘ministry’ was overly influenced by the weight of a century and a half of service that was always hands-on and other-focussed in the sense of ‘doing for’ those in need who came to our convents, hospitals, or schools. That ministry to ourselves, through renewal by way of immersion in a rich heritage, would in turn lead to reinvigorated ministry to others was not taken fully on board. The consequent decision to leave the ‘ministry’ and outreach element of the plan to Ireland and to Herbert St. affected the integrity of the building. It helped solve a funding problem while it divided a site. A survey of the entire building was the first real piece of practical work in which I was involved. Surveyor, Mr. Peter Murphy, now alas deceased, did a thorough job. What impressed me and stays with me vividly about that tedious task of measuring and mapping was the welcome, hospitality and fortitude of the resident community. This was their home and strangers were walking all over it and they facilitated every move. I got to know every nook and cranny in a building full of stories – many of the ‘nooks’ disappeared in the transformation. Another memory is the generousity, patience, endurance, ingenuity and self sacrifice of Mary Quinn rsm and Elizabeth McCaver rsm, who really bore the brunt of the work. Theyliterally lived on the building site – slept and ate, telephoned and faxed, typed and copied, banked and bargained from the confines fron the now very clean and comfortable, if grandly named, ‘McAuley Wing’! In the meantime Mary Trainer used all her considerable charm in persuading, convincing, coaxing her many friends in the US to part with their dollars. 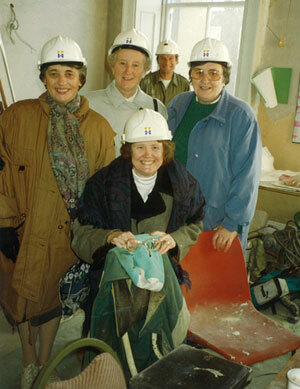 In Dublin she negotiated with lawyers, accountants and church leaders; she convinced the Mercy Family orldwide of the value and importance of the project. Her energy and single minded purpose kept everyone headed towards the goal . Mary really made it all happen.